As far as Cain, however…the point isn’t really that “candidates without an electoral track record haven’t won the nomination.” It’s that they haven’t really come close. The best showings by candidates who hadn’t been elected to anything were, if I recall correctly, Jesse Jackson’s campaigns in 1984 and 1988; Steve Forbes in 1996 and 2000; and Pat Buchanan in 1996 (and, I suppose, 1992). I certainly wouldn’t count Wes Clark’s 2004 campaign; military heroes, of course, have a long history of winning nominations. I suppose Pat Robertson in 1988, too. Let’s look at this evidence in a somewhat more comprehensive way. I have a database of polls (you can download the Microsoft Excel version here) conducted in January through June of the year before the first primary election (for example, polls conducted in January through June 1987 for the 1988 Democratic bid). I identified all candidates since 1972 who: (1) had never held elected office at the time they ran for president, (2) were included in at least one of these early polls and (3) officially declared for the presidency at some point in the cycle (as Mr. Cain has done), even if they pulled out before the first primary. I identified a total of 14 candidates who met each of these criteria, counting Pat Buchanan, Alan Keyes and Jesse Jackson twice apiece. There were some additional candidates who entered the race at a later stage and wound up winning a few votes — like Steve Forbes in 1996 — but they weren’t included in any of the early polls, so they aren’t included in the table. Indeed, none of these candidates did terribly well (although four of them won at least one state). And as Mr. Bernstein notes, some of them were better credentialed than Mr. Cain, having held leadership positions in the military (Wesley Clark), in a presidential cabinet (Elizabeth Dole), or both (Alexander Haig). Also, many of these candidates were quite well known to the American public, unlike Mr. Cain. All but four of the candidates — Mr. Clark in 2004, Gary Bauer in 2000, Mr. Keyes in 1996 and 2000, and John Cox in 2008 — had name recognition above 50 percent at this point in the nomination process. 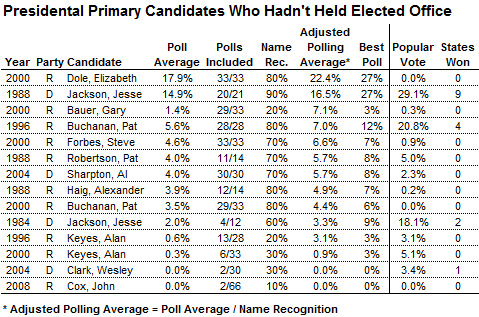 On the other hand, Mr. Cain’s polling is probably more impressive than any of them. Just three of the candidates — Mr. Jackson in 1988, Mr. Buchanan in 1996 and Mrs. Dole in 2000 — achieved 10 percent or more of the vote in any individual poll, something Mr. Cain has now done with the release of this morning’s CNN survey of Republican voters, which put him at 10 percent of the vote exactly. But whereas Mr. Jackson, Mr. Buchanan and Mrs. Dole were household names, Mr. Cain is anything but, with name recognition that barely exceeds 30 percent. Michael Dukakis polled at 11 to 13 percent in several surveys from April through June 1987 despite having name recognition of about 30 percent. John Edwards polled at 10 to 14 percent in several surveys in early 2003 despite having name recognition of about 30 percent. John McCain polled at 12 percent in one survey in May 1999 despite having name recognition of about 40 percent. That’s a very impressive group! Mr. Dukakis won his nomination. Mr. Edwards finished in second place in 2004 and became John Kerry’s vice-presidential nominee. Mr. McCain finished in second place in 2000 and became his party’s presidential candidate in 2008. Some of the “near misses” are also auspicious. Richard A. Gephardt and Al Gore polled in the high single digits at several points in early 1987 despite very low name recognition; they both went on to have distinguished political careers. Mr. Kerry routinely polled in the double digits in early 2003 with name recognition of not much more than 50 percent; he won his party’s nomination. George McGovern, with name recognition of about 50 percent, polled at 10 percent in a poll in March 1971; he became his party’s nominee. There are some counterexamples — Phil Gramm polled in the double digits in early 1999 with middling name recognition and his candidacy flopped — but usually this is a signature of a candidate with a great deal of upside. Candidates with electoral resumes as thin as Mr. Cain’s have very poor track records. But none of them have polling that was as impressive as Mr. Cain’s. Candidates with polling that looks like Mr. Cain’s — with numbers in the high single digits or low double digits despite very low name recognition — have an exceptionally good track record. But all of them were far more credentialed than Mr. Cain. So how do we resolve this? We can’t really resolve it empirically. I wrote in yesterday’s piece about how analysis of presidential elections is inherently limited by small sample sizes. But this is even worse: the sample size is essentially zero. In the post-reform primary era (1972 onward), there’s never really been a candidate that combined such limited name recognition, such underwhelming credentials — and such impressive polling. Perhaps we might resolve it with theory. Mr. Bernstein, later in his article, articulates his theory of how presidential nominations are made. Although you should read his entire article to get a better sense of it, it’s one that places a relatively greater role on elites and party leaders who solicit input from the public, but also have a variety of ways to coax them toward their preferred choices. We might call this the Elites or Top-Down Theory of presidential nominations. I tend toward an interpretation, instead, that sees rank-and-file voters as having a more active role. (This is partly because my research suggests that early primary polls, particularly if adjusted for factors like name recognition, have more predictive power than political scientists generally give them credit for.) Elites can put their finger on the scale and their preferences certainly do matter — but voters still have the final say and will sometimes foil their best-laid plans. We might call this the Populist or Bottom-Up Theory of presidential nominations. These are, of course, gross oversimplifications of the respective positions. But if you’re a proponent of Top-Down Theory, Mr. Cain has very little chance to win the nomination. If you buy into Bottom-Up Theory instead, he might have quite a good chance. If we want to adjudicate between the two theories, however, the problem of limited sample sizes returns again. Most of the time, there is a convergence — even in the early stages of the process — between what elites want and what rank-and-file voters want, and so these data points aren’t useful for resolving the debate. This has been especially the case on the Republican side. In all but one competitive Republican primary in the reform era, the candidate who was leading in the early polls won (the exception being John McCain in 2008, who ran in a strong second place). But the winning candidates, also, had plenty of support from elites. Mitt Romney, a candidate who is acceptable to some but not all Republican elites, is in first place. But in second through fifth place are Sarah Palin, Newt Gingrich, Ron Paul and Mr. Cain, none of whom are considered “serious” candidates by many in the Republican establishment. There’s never been a Republican field that has featured remotely so much tension between popular and elite opinion. With candidates like Ms. Palin or Mr. Gingrich — or Donald J. Trump — you can chalk up much of their support to name recognition. That doesn’t hold for Mr. Cain, however. He is now running ahead of Tim Pawlenty, for instance, despite having considerably lower name recognition. So this Republican primary in general, and Mr. Cain’s candidacy in particular, is going to be extremely interesting for polling junkies and political scientists. It will teach us a lot about how presidential nominations are decided, and it will teach us a lot about the power or lack thereof of the Republican establishment against the party’s grass roots, the blogs and the Tea Party. In the meantime, we should be careful about declaring which candidates are viable and which aren’t, especially candidates so unusual as Mr. Cain. But while political scientists and polling junkies can sit on the sidelines, chew their popcorn and wait to see how the nomination is resolved, another group has some more immediate decisions to make. These are the members of the political press, who must determine how much coverage to give to each candidate. I got into a minor debate on Twitter yesterday with Politico’s Ben Smith about the viability of Mr. Cain’s candidacy. This debate — like most on Twitter — was not really on track to be resolved to anyone’s satisfaction. Fortunately a couple of friends intervened before either of us got a call from our editor. This is a question, however, that needs to be discussed more openly. What are the appropriate criteria by which the press should determine how much coverage — and what type of coverage — to give to each presidential candidate? Should it be based on polls? On who has taken the most concrete steps toward actually running? On the credentials of the candidates? On elite sentiment? On site traffic and click-through rates? If you accept that some candidates should be given more coverage than others (and some people don’t accept that), what should the ratios be? I don’t claim to have all the answers. But I do think it’s important for the press to err toward the inclusive side. The reason is that the press itself plays a role in the nomination process. Getting a reasonable amount of media coverage is one of those things that makes a candidate viable. Suppose that a media organization reviews its coverage decisions in past campaigns, and discovers that the candidates it ignores tend not to do very well. One interpretation of this is that the press has correctly anticipated which candidates are viable and which aren’t. The other interpretation, of course, is that this is a self-fulfilling prophecy: the candidates who did poorly did so in large part because the press ignored them. When you come across a candidate like Mr. Cain, who is now doing quite well in the polls despite his lack of media attention, that would seem to compel more of it. It’s a clear a signal as any that press coverage has become misaligned with public sentiment. This is a very different case than one like Mr. Trump, whose surge in the polls coincided with an overwhelming amount of media attention. Perhaps Mr. Trump’s polling bounce (which has long since burst) was caused by the press attention or perhaps it wasn’t, but his case and Mr. Cain’s are in no way alike and arguably closer to being opposites. Increased press coverage doesn’t always turn out well for a candidate, of course — look what happened to Mr. Trump once the media started to treat him as a presidential candidate rather than a novelty. It may be time to apply the same scrutiny to Mr. Cain. Perhaps his campaign will wilt under the pressure, but my guess is that he wouldn’t mind the attention.